American Garage Door is the area’s largest retailer of quality modern residential garage doors. We are proud to be a local retailer of Raynor Garage Doors, Clopay—America’s favorite garage doors, and LiftMaster®. These manufacturers build their residential garage doors with quality materials by well-trained and experienced craftsmen. At American Garage Door, we hold ourselves to a high standard because we know that your home is important to you and we want to help you make your home beautiful and safe. Our company offers many residential garage door and electric operator options to choose from when designing your home. We have something for every home. Call today to discuss what you want to install at (304) 592-0936 or contact us online anytime at your convenience. Do you know which kind of garage door works best for you? Knowing the “what” and “how” of a product can help with the decision-making process. The garage doors sold by American Garage Door are made from heavy-duty steel and are constructed in three different ways as noted below. They are all energy efficient and have a great range of insulation value: Non-insulated, Insulated – R6.5, R9, R12.9, and R18. With our doors, you can have a non-insulated garage or a fully-heated garage. Two Layer Construction – Constructed of steel. Fitted with a layer of expanded polystyrene board insulation and a thin, protective vinyl back cover. Insulation increases energy efficiency and soundproofing and adds greater structural integrity. These doors also offer good protection and security. Three Layer Construction – Constructed of expanded polystyrene insulation or polyurethane insulation between two steel skins. Provides maximum energy efficiency, soundproofing and structural integrity. This door by far is the longest lasting and the most durable. If a commercial garage door would better suit your needs, just ask the professionals at American Garage Door! American Garage Door offers many customizable features, allowing you to find a residential garage door that compliments your home. All garage doors sold by American Garage Door are custom ordered by size, color, and style just as you designed. Accessories such as decorative hardware, window grids, and recessed and mixed panels can add the perfect touch, making your garage door one of a kind. Ran into your door and damaged a panel? Accidents happen. No need to buy a whole new door! American Garage Door can fix you up! 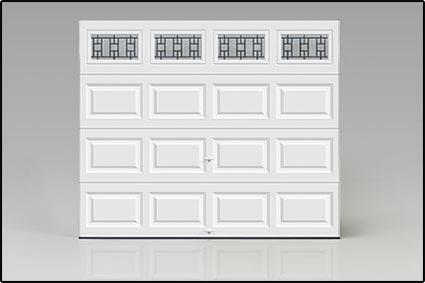 We offer replacement panels for most brand-name garage doors. We can order your replacement panel and have your door functional again in no time. Chain Drive Operator – ½ Horsepower, chain, home WIFI compatible, vehicle programming, remote and keyless entry accessible. Emergency release included. Belt Drive Operator – ½ Horsepower, belt driven, low noise, home WIFI compatible, vehicle programming, remote and keyless entry accessible, optional emergency battery-backup. Emergency release included. We also carry a variety of remote controls, keyless entry pads, and other accessories for past and current operators. New operators can be installed on both new and existing garage doors. *Customers are responsible for providing and wiring outlets or wiring of operator or photo eyes for residential garage door use. Electrical outlet installation is not part of the service American Garage Door provides. Property owners must ensure adequate energy for operation based on your home’s energy needs. Customer service is our number one priority at American Garage Door. We want to make the garage door buying process as easy as possible. When you call American Garage Door, you know you are working with an honest, reliable company. We take care of our clients and understand your time is valuable. When beginning the garage door purchasing process, a dependable American Garage Door team member will visit your home or business to analyze your space and record accurate measurements. They will review those measurements with you and discuss your options, providing you with informative brochures to help you make your decision. Our staff has been at this for years and will listen to your ideas and advise accordingly. We offer same-day quotes (some even on the spot), making the ordering process a breeze. Once your garage door order arrives at our location in Shinnston, we call you to discuss the upcoming installation. We arrive at your location as soon as possible to install your new residential garage door and generally complete our quality installation within a day. Contact American Garage Door today with any questions on our ordering process or our products: (304) 592-0936.